Lib Dem leader Nick Clegg has avoided a grassroots rebellion over his proposals for a shake-up of the NHS. The party's spring conference in Liverpool voted overwhelmingly to back his plan to give patients the option to seek private treatment if needed. But he was forced to offer concessions on locally elected health boards - with delegates voting for a third of members to be made up of local councillors. They also backed proposals to limit private sector involvement. But Lib Dem health spokesman Norman Lamb stuck to his guns over controversial plans to scrap extending free personal care for the elderly, introduced by the Lib Dems in Scotland, to England. He said the party wanted to introduce a "universal care guarantee" instead, which would give people more control over how money for personal care is spent. He said the policy was "fair and also sustainable given the massive challenge of an ageing population". 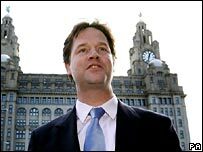 A defeat for the party leadership on health would have come as a major blow to Mr Clegg, who is trying to reassert his authority after criticism of his handling of an EU vote in the Commons. He believes a more personalised and decentralised NHS putting more power into the hands of patients will be the key to success at the ballot box. But critics on the left of the party say his "patient guarantee" - which will allow people to go private if they cannot get the treatment they need from the NHS - is too similar to Conservative and Labour policies. The government is also making increasing use of private treatment centres. There is also concern among some in the party that it will lead to the creeping privatisation of local NHS services. But Mr Lamb told delegates: "Too much money has been wasted by needless top-down, botched reorganisations which drive clinicians and patients crazy and leave local communities with no say." He said the Lib Dem plans were targeted at those "most in need". Delegates nevertheless backed an amendment "to ensure private sector procurement does not destabilise local NHS provision". They also voted for an amendment - supported by the leadership - giving local authorities a say in how elected health boards, which are meant to replace Primary Care Trusts, would be run by making a third of their members councillors. Under the Lib Dem proposals, patients will be given the right to taxpayer funded private care if the NHS failed to offer treatment within a maximum waiting time. People with long-term physical and mental conditions would also be given direct control of personal budgets. Mr Lamb said he was "thrilled" to get the proposals through conference and denied they were the same as the Conservatives' "patient passport" policy rejected by voters at the last general election. He said the Tory plans would have enabled the middle classes to opt out of the NHS altogether. But he said the Lib Dem proposals would be aimed at the poorest in society who had not been able to get the treatment they needed on the NHS. "There are voices in the party who are just hostile to any reference to the private sector," he told reporters before Saturday's debate. But, he added, the number of people opting to use private services would, in practice, be "tiny" - if the experience of Denmark, on which the party had based its policy, was anything to go by.